The perfect solution for keeping your car clean and sparkling. The three products in the Car Cleaning Kit and water are all you need to quickly clean, dry and shine your whole car. e-auto products are so powerful, they can clean using just water. They will also perform well with a small amount of your regular cleaning liquid. The 3 products in the Car Cleaning Kit will quickly clean, dry and shine your whole car, without the need for chemicals. The Super absorbent Dry & Shine Cloth provides aperfect streak-free finish by removing excess moisture and residues that ordinary chamois leave behind. How e-cloths work" e-auto cloths have 480,000 fibers per cm2 (1.6 million fibers per square inch). By using e-cloths unique fibre technology with water, they break up and hold grease, grime, dirt and bacteria, which normal cloths leave behind. e-auto cloths are so powerful, they can clean using just water. They will also perform well with a small amount of your regular cleaning liquid. For all Hard Surfaces: Paintwork, Chrome, Lights, Glass Why use e-auto: Save Time- just use water or a small amount of your regular liquid. Save Money- reduce the use of car cleaning chemicals by up to 90%. Guaranteed 300 washes. Better results- a sparkling smear free finish, using just water. Dual Action Mitt - Thoroughly wet vehicle to loosen heavy dirt. 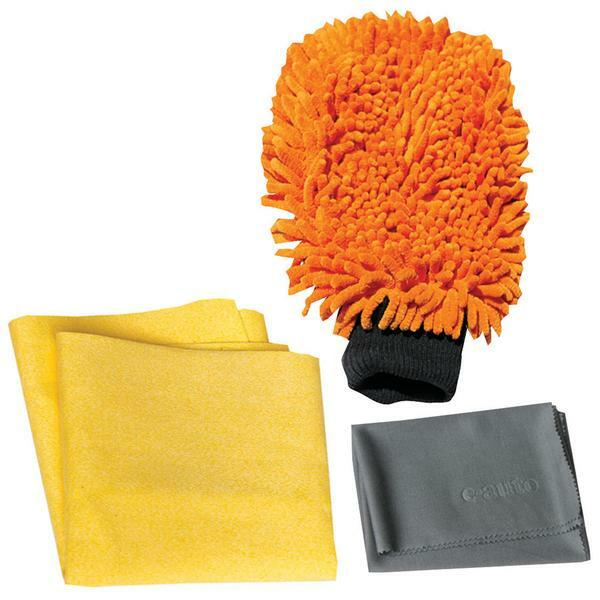 Wet the Dual Action Sponge and use the orange side for general cleaning. Use the grey side to remove stubborn stuck-on dirt, insects, and other cleaning challenges such as tar spots. Rinse the sponge in a bucket of water thoroughly and regularly to ensure the sponge does not trap dirt or grit in the fibers. Grit may damage the car’s finish if not rinsed out. Dry and Shine Cloth - Use the cloth dry on damp surfaces. Fold cloth regularly to ensure the cloth does not trap grit or dirt in the fibers. Trapped grit or dirt can scratch the vehicle’s surface. Glass and Chrome Cloth - Use the cloth dry on a dampened surface to remove light grease and finger marks and to dry to a perfect, smear-free, polished finish.